One is to go out in wider waters from a sheltered place. The other is to go into a sheltered place from wider waters. They say you don't pick your boat, but that your boat picks you. 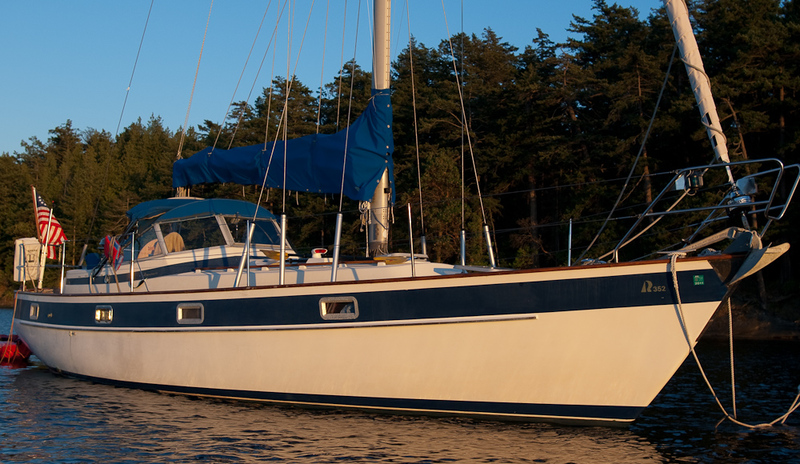 I was not really in the market for a new boat but in May of 2008, five years after finding our first boat, Gata Luna, I saw an ad that looked too good to believe. It was for a 35' Hallberg Rassy 352. In short, the boat had been neglected but she was solid. I bought her and had her shipped to Seattle. Someday I hope she will take me and my family far from Puget Sound in comfort and safety. In this section of our site I hope to share the stories of restoration, exploration, and learning aboard our Hallberg Rassy 352 'Seaquester'. Origins - How and why we got a new boat. Purchase - Photos from when I bought her. Portlights - Replacing the ports. Stanchions - Rebedding the stanchions.